B&W PM1 review | What Hi-Fi? Some folk might find the idea of spending £2000 on a speaker barely bigger than a decently sized shoebox a bit odd. Not us…There’s no getting away from the fact that any speaker that stands just 33cm high and sports a single 13cm mid/bass driver is never going to match the bass depth, authority and outright volume of the big boys at this price level. But it seems nobody reminded B&W’s engineers of that. While the PM1s don’t quite manage to slip through a physics loophole, B&W’s boffins have managed to eke out a surprisingly bombastic sound from tiny 6.5-litre boxes. In small- to medium-sized rooms, these standmounters deliver impressive bass power and weight for their size. That little Kevlar mid/bass driver, along with the company’s now-traditional dimpled reflex port, produces low frequencies with plenty of gusto. Sure, bigger rivals go even deeper, but the B&Ws never sound undernourished or bass-light. That’s a massive achievement in something so small. They’ll go loud enough for most people, too. Play In the Hall of the Mountain King from the Social Network OST and these standmounters throw out a huge sound, with waves of strong dynamics and plenty of bass. Push them really hard and things get a little confused, but by that time the speakers are playing way louder than we’d consider comfortable. Move past the areas where all small speakers struggle and the PM1s set sky-high standards. They sound immensely fast, delivering transients with the kind of cohesion you usually only get with single-driver designs. 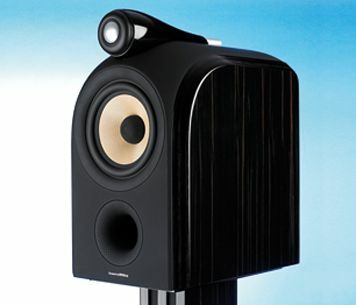 B&W has put a great deal of work into the PM1s’ crossover network, and it shows in the speakers’ seamless integration. The electronics are simple, with just three components in the circuit. Such a design is always hard to get right, despite the use of top quality parts – the PM1 uses a similar grade to those found on the company’s range-topping 800 series speakers – but B&W has nailed it here. The two-driver arrangement looks a lot like standard B&W fare, but there’s been a lot of refinement going on. The 25mm aluminium dome tweeter, for example, is reinforced with a carbon ring to improve its frequency range and distortion performance. The dome sits in the usual decoupled tweeter pod, and a rear-mounted tapered tube absorbs any stray sound waves (see below). The 13cm woven Kevlar cone now features an anti-resonance plug at its centre. This plug is made from polymer foam and, as the name implies, cleans up the cone’s response with the aim of producing a more transparent sound. Of course, neither driver can work well if the cabinet isn’t doing a good job. The PM1’s cabinet is surprisingly heavily braced for one so small, giving a rigid foundation for the mid/bass driver to work from. The curved front moulding looks like a one-piece affair, but is in fact made in two parts and finished to look seamless. It’s shaped to have minimal influence on the sound, and it doesn’t hurt if the final result looks as stylish and distinctive as this. All this careful engineering produces a wonderfully clean sound, one that picks up subtle detail and manages to keep it audible no matter how complex a piece of music gets. The PM1’s insight into recordings is absolutely top class, with the speakers leaving no stone unturned when it comes to digging up low-level information. These B&Ws, like many small speakers, can also deliver impressive stereo imaging. Listen to Tchaikovsky’s 1812 Overture and the PM1s excel with instrument placement and focus, and a beautifully layered and impressively expansive sound stage. Perhaps most impressive of all is their ability to disappear within the presentation. Close your eyes and it’s nigh-on impossible to locate the boxes without looking. That’s not where the good news ends. These standmounters time very well, and can convey rhythms excellently. Play the likes of Kanye West’s Monster and the PM1s charge along at full throttle when the music demands. They communicate the sense of drive, aggression and excitement in this kind of music terrifically well and, provided the rest of your system is good enough, these speakers can’t help but shine. As far as kit-matching is concerned, the B&W PM1s will sound perfectly good with the likes of Roksan’s Award-winning £1595 Caspian M2 integrated amplifier. But, such is their transparency that their sound continues to improve significantly as the partnering electronics increase beyond that level. You’ll need the dedicated stands, though. These £400 supports were used during the PM1s’ development, and it shows: no other stands we tried (and we have a more than a few on site) gave the same sense of control and balance. The aesthetics match too, which is nice. Put it altogether and you have a hugely capable pair of small stand-mounters that work well with all types of music and engage the listener better then just about any B&W speaker we’ve heard in years. Sometimes great things really do come in small packages.